I hope you will enjoy this letter from Chris known as the ‘bead man’ for his love of the beads made by some members of our community. He is a great friend and the people at the project love it when he is there and continually ask me when he is coming back to see them. He has written this lovely account for you about some of the work of the adults. 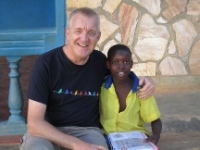 I am sure you will enjoy this insight into another aspect of our work at Kinamba. I spent three glorious months at Kinamba over the winter. For the most of that time the school was closed, but that doesn’t mean that nothing was happening at the project! Meg’s recent newsletters have given details of the various building improvements that took place in that time. As well as keeping an eye on operations it gave me a chance to spend more time with the women of the handicrafts co-operative. Most members of the group first became associated with the project by attending adult literacy classes. They then grasped the opportunity to learn new skills through classes set up by Meg – including tailoring, basket making and bead making. Now a number of the women use a room at Meg Foundation to make handicrafts for sale to tourists and for a burgeoning export trade (using contacts established through project volunteers). 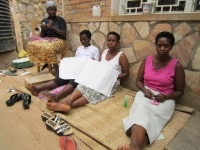 They are a happy group deriving companionship as well as income to sustain their families. It’s normal to hear laughter or singing from them as they beaver away. Sometimes I can’t help but pay a visit to join in the fun! It always provides a great opportunity for me to practice my Kinyarwandan and learn some new words. Sometimes they have a private joke at my expense which always causes a great hoot of merriment, especially when I feign understanding and join in. The variety of handicrafts produces continues to grow – quality basketware, beautiful greetings cards (handmade from banana leaves), fabric dolls and animals, patchwork bags and aprons, beadwork animal brooches. 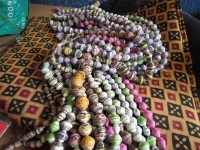 One of the most fascinating items they produce are necklaces of handmade paper beads. Many of you will have seen these and, perhaps, bought them. Have you ever wondered how they are made? I had a lesson on how to make beads and learned what a long, laborious task it is. The basic raw material is a large sheet of paper such as an old magazine, calendar or poster. From this they produce long thin triangular strips, by carefully drawing lines on the reverse of the paper then cutting along the lines to make the triangles. Then, starting with the broad end, the paper triangle is rolled into a bead shape with the tip being glued to secure. Clearly,it has to be ensured that a hole is left in the middle of the bead! The breadth and length of the paper triangles determine the shape and size of the bead. Once a large quantity of beads are ready they are strung together and dunked in varnish before being hung up to dry. The drying process takes two days. When dry the beads are ready to be matched up and strung on a necklace, bracelet or earring and a clasp applied. (The photographs illustrate each of these stages). Each bead, and therefore each necklace, is unique. The pattern and colours on the original paper provide the individual pattern of each bead (Rwandan pearls!). Sometimes we take out some coloured paper from the UK to provide some variety. (If you happen to have a stock of wrapping paper or promotional leaflets that you could donate, please let us know). On the return journey to the UK we bring back the finished necklaces, which have proved popular with our supporters. All proceeds go back to Rwanda and help these women support their families. An element of the profit goes to the feeding programme at the school. This enables us to provide a daily meal to the most needy children in the community. And so, the simple recycling of paper is helping to feed the people of Kinamba. If you’d like to buy some beads, or other handicrafts, or even hold a beads party night with your friends, please get in touch.